As I landed at Chennai Airport, I quickly queued up at the Pre-paid taxi counter and booked myself on a cab to my destination. I took the receipt and headed out of the airport. When I got into the cab, I found the driver unusually polite. People who are not from Chennai have some really bad tales to tell about Chennai cab and auto drivers. This guy was a far cry from those in the horror stories! He also had a charger available that had cables for almost every phone you could imagine! He was talking to me in broken English about the weather, the traffic and myriad other things. After a few minutes, I understood why. He asked me, "Which country?" I was surprised! This was the first time I got asked this! I said, "Hyderabad, India only!" He seemed shocked and disappointed at the same time. "Hindi aata?" Whatever little conversation we had after that was all in Hindi. He probably thought I was from a foreign land because of my new goatee. Whatever misconceptions about Chennai cabbies were cleared in the first half of the ride were built up again in the latter half! Whenever I go for the first time to any of our dialysis centers, I am filled with a sense of apprehension. How would the staff react to me? How would the patients react? Chennai was very pleasant on both counts. The staff were really thrilled to meet me! They had seen very few patients who had survived so long and were very motivated with my talk to them about the NephroPlus philosophy and culture. The patients I interacted with were quite surprised that I was actually on dialysis. They asked me a lot of questions they had. I answered some of them and suggested that they ask their nephrologist about some of the medical ones. One thing I see in NephroPlus centers is that the patients love the staff. Many of them have dialysis centers close to their homes but they still travel long distances because they like our staff so much that they cannot think of leaving them and going elsewhere! When you see patients feeling happy when they come for dialysis, laughing and chatting with the staff, you feel a sense of warmth in you. When patients commend you for changing the unit and providing many conveniences that makes life much simpler for them, you feel a sense of unbound happiness. This is really what dialysis should be like. Something you do not really have to dread, something you are comfortable with. I can never do anything else for a living after this! Chennai is a place I love for its food. The rice idlis made here are like nowhere else. Luckily for me, our dialysis center, the hotel I was staying in and my favorite eating joint - Murugan Idli Shop were all very close to each other. I went there for all my meals! Why go anywhere else? I got to sample the idlis (of course), the vada, the uttapam, the mini meal and the full meal over the course of four different meals. The idlis really are something else. I have yet to eat a rice idli that is better than this. The vada is also really excellent. Most times in the past, I have had only 'tiffins' - or snacks like idli, vada etc. This time I got to try the mini meal and the full meal as well. The mini meal was good. The full meal was a revelation however! They serve a bowl of steamed rice and then one by one, a waiter comes along with various accompaniments - each better than the other! The only trouble was I was totally uninitiated. I had no clue on how many such accompaniments were there and did not know how to plan my meal to make sure I did justice to all! This was definitely one of the best 'South Indian Meals' (that's singular btw!) I have ever had! 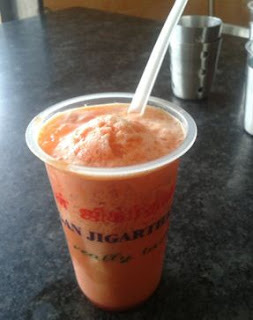 Staying with Murugan, as I walked into the outlet serving the meals, my eye caught a small little section at the mouth of the outlet that was serving some delicious looking drink called the 'Jigarthanda'! This means something that cools the liver! I promised myself the treat on my way out. It was a difficult task given the sumptuousness of the meal itself. But no meal can fill a dialysis patient enough to say no to a good looking drink! Trust me on this! I ordered the Jigarthanda and relished every drop of it. The sweltering Chennai afternoon made my task much easier. I could actually feel my whole body (including the jigar, of course) become real thanda!